More and more children seem to experience symptoms of allergy when they eat particular foods. Some reactions are annoying and irritating, while others are much more worrying. But which foods should parents be wary of and is your child really at risk? What Does It Mean If Your Child Has An Allergy? When a child is allergic to a particular food, that food triggers the immune system into releasing antibodies called immunoglobulin E. These in turn trigger the release of histamines, and it’s these that cause all the unpleasant symptoms. Which foods might cause an allergic reaction in children? Although any food can cause an allergic reaction, there are some that are much more commonly to blame than others. Nuts, milk, eggs, fish, tomatoes and citrus fruits are often trigger foods. If you find that your child is allergic to a particular food, be wary of other allergies to foods in the same family. For example, if your child is allergic to a type of fruit, be careful about giving any kind of fruit unless you’re absolutely sure it’s safe. If you suspect a food allergy, you’ll need to be vigilant about reading the backs of packets. Many foods, particularly Soya and wheat, are ‘hidden’ in lots of processed foods, including meat and veggie burgers, ready meals, breakfast cereals, cakes and biscuits. In fact, many of the things we feed to our children every day contain a host of hidden ingredients. That’s why it’s a good idea to cook from scratch whenever you can. That way, you’ll know exactly what your child is eating. Sickness and diarrhoea, runny noses, rashes and sneezing could all indicate a food allergy, but they could also be symptoms of other childhood illnesses – run of the mill ones like coughs and colds, or more serious conditions. To find out if your child really has a food allergy, you’ll have to see your doctor. What Should You Do If You Think Your Child Has A Food Allergy? Of course, every parent should be aware of what their child is eating, whether or not an allergy is suspected. If that’s the case, any patterns of bad reactions should be obvious before too long. If you think your child might have a food allergy, start keeping a food diary. Write down what they eat and when, any reaction that occurs and anything else that might be relevant, such as if you were at a particular restaurant or family member’s home. After a week or two of filling in your food diary, go and talk to your GP. Resist the temptation to start cutting out all potential trigger foods from your child’s diet. 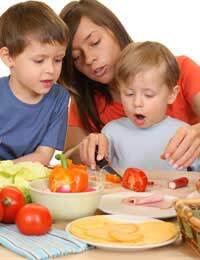 You could be cutting out nutritious and tasty foods for no reason, and creating a sense of food paranoia in your child. Talk to your doctor about finding out if your child has a real allergy, and about ways to pin down exactly what the allergen is. That way, you can start to take measured, practical steps towards eliminating the problem food.